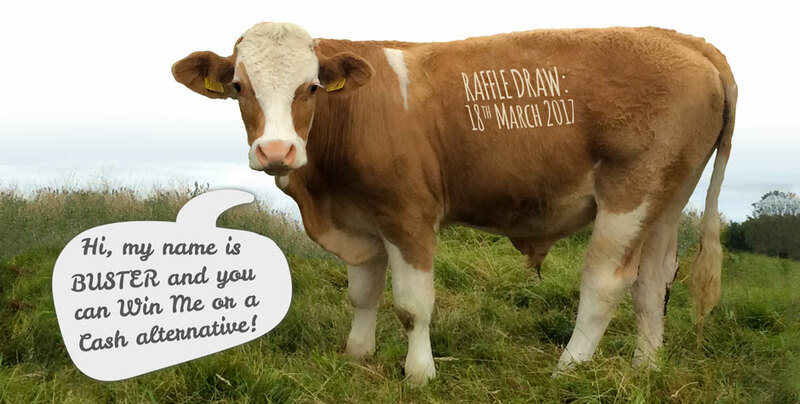 Purchase a ticket to support sick children in your community and be in with the chance to WIN this gorgeous Simmental Bullock! We receive donations of all kinds and this one is quite special… After we asked you to give this bullock a name through a Facebook competition we have now started a raffle and sell tickets to get this burly lad into a new home next year, in March. All proceeds go to The Jack & Jill Children’s Foundation! 1. This raffle is organised and administered by The Jack and Jill Children’s Foundation, Johnstown Manor, Johnstown, Naas, Co. Kildare. Registered Charity No. CHY 12405. Lottery License issued at Naas District Court. – Be over 18 years of age by 1st January 2016. – Not be a member of The Jack and Jill Children’s Foundation staff. – Have purchased at least one ticket at €5 each. 3. The prize consists of 1 Simmental Bullock. 4. Closing date for returning tickets to the Jack & Jill office and entering the draw is March 16th, 2017. 5. The winner will be drawn by an independent person on 18th March 2017 at Millar’s Bar & Lounge, Ballydangan, Athlone, Co. Roscommon. The promoter’s decision is final and no correspondence will be entered into. The winner will be notified within 5 working days of the draw date either by mail or telephone. The winner’s name will be announced on www.jackandjill.ie. Full address will not be disclosed. 6. If the writing is illegible on the ticket and no contact details are given, a new winner will be selected on the day of the draw. 7. By entering the draw, winners confirm their agreement to take part in any associated publicity. 8. The Jack and Jill Foundation respects and is committed to protecting your privacy. The personal information you provide will remain private and will only be used for the purposes outlined here.